IS THE NCC VERIFIED BATTERY SCHEME FLAWED? The NCC Verified battery scheme claims to work for the consumer. It is rated at a poor 70 cycles yet costs £99. The Alpha Batteries web pages show how easy it is to compare batteries and it highlights the Platinum LB6110L as a very poor one, yet it is 'Verified' by the NCC. You can see the description on the label of the Platinum LB6110L above states a very misleading "Extra Long Life" when 70 cycles is extra SHORT life", that is blatant mis-selling that the NCC Verified scheme has approved. The '40% Extra Life' and other slogans like 'Frequent Traveller' and 'Leisure Plus' are all designed to deceive you into thinking it is a highly durable, extra heavy Duty battery, when it is actually one of the shortest life batteries on the market. It's internal construction and specification are no better than a poor quality Starter battery. The model name of LB6110L is also designed to deliberately deceive that this could be a 110Ah battery, not the 100Ah it is rated as. You can easily see how the Platinum marketing teams approach to deliberately mislead might extend to inflating the Capacity and cycling figures? You probably wouldn't get even 70 cycles, just as we didn't when we tested one. Our own test on this battery showed it delivered less than 30 cycles and had a real capacity of nearer 90Ah. The NCC Verified Battery scheme claims to protect consumers so should never allow a battery, that is clearly in breach of Trade Description guidelines, never mind anything else, into the scheme. "4.1.4 Model numbers that can be confused with capacity, i.e. 12V110, shall not be used". So how does the poor performing Platinum LB6110L battery, that not only breaks the NCC's own rules and Trading standards guidelines, make it into the NCC scheme? The NCC Verified Battery Scheme promised such a lot when it launched a couple of years ago, but it isn't delivering. Every expert we speak to is puzzled as to how the high quality Exide EP800, weighing a chunky 26.5kg, only receives a verified 360 cycles from the NCC Verified battery scheme, yet the very ordinary Leoch Xtreme XR1750 is 'verified' at 600 cycles with only 21.2kg of Lead? The Leoch is a very ordinary battery, it is almost 25% lighter. With the technology it uses, it would be chemically impossible to even match the Exides 360 cycles let alone reach 600. Battery experts we have spoken to think it would struggle to reach 200 cycles. So you can understand why some people are thinking money has changed hands for the Platinum LB6110L and Leoch Xtreme XR1750 to be given such a rating by the NCC Verified scheme. Did you know that battery companies do actually pay the NCC to 'verify' their batteries? Such an arrangement would normally be 'open and transparent' with all the test results published so that everyone can see fairness in action. Yet the NCC refuse to publish any test results. Did you know that the NCC verified scheme also condones manufacturers being able to overstate a Batteries Capacity? You could be buying a 'Verified' battery that actually has just 95% of the stated capacity on the label and this is acceptable to the NCC. "5.2.1 Capacity (C20) in Ah, - To meet the requirements of the scheme the capacity must be no less than 95% of that claimed by the manufacturer within the submitted documentation". The 'Budget' battery manufacturers are taking advantage of this to provide a battery that actually is only 95% of what it says on the label, defrauding the public. Contrary to the approach by the 'budget' suppliers, the big battery companies like Yuasa, Varta, Exide, Banner, etc. do the opposite and understate the battery capacity, so with a big name manufacturer you may get a 104Ah when the label states 100Ah. With a Platinum LB6110L battery you can be lucky to get even 90Ah. Doesn't that suggest the NCC Verified battery scheme is working in the interests of the companies that fund it and the 'unbelievably good' test results for some batteries are exactly that, unbelievable? We have been campaigning for change. We want the NCC scheme to be open, honest and publish all it's results and do what it promised at the start. Alpha Batteries have already started adding more Technical Information and Downloads to the website sales pages so people are better informed. The Alpha website contains so much information, it allows everyone to do their own comparisons. If the same information was on every Leisure battery label in Green to Red 'Traffic Light' colours, it would allow anyone to make better decisions on what battery is right for them. It is hoped that a 'Traffic Lights' style of labelling can make it onto the National Stage. Improved labelling will also make it easier for Government Departments to prosecute unscrupulous Battery Retailers and better protect the public. Clearly the NCC scheme isn't working for the consumers and they are not driving in a better direction, but one of the biggest issues is that the NCC promote AGM batteries for use into Caravans and Motorhomes when almost zero Caravans have an AGM optimised charger and less than 1% of motorhomes. All AGM battery manufacturers state that the battery life will be shortened if the correct charging solutions are not used. We want the NCC scheme to warn that AGM batteries must have AGM optimised chargers and Alternators. The nicest surprise in support of our assertion that AGM batteries are not suitable in Motorhomes, came from an article in a September 2018 Caravan and Motorhome Club magazine on 'Choosing Leisure Batteries', Page 114. Thank you Arthur for the Info. For the first time EVER, the CAMC publishes advice to actually avoid AGM batteries in line with our campaign. See further down these pages, for our reasons why AGM batteries don't work in motorhomes. "In general, it's probably best to avoid AGM batteries unless you are absolutely sure your charger is suitable, as the otherwise excellent performance counts for little if the performance is compromised through damage by inappropriate charging". That warning has never before been published by a Magazine or Club. We consider that a huge breakthrough in helping to stop people from being disadvantaged by unsuitable battery sales that end up costing the buyer twice as much with half the life. Hopefully things will now change and the NCC Verified scheme front page will also start warning people that AGM batteries should only be used if the Alternator output voltage (most are too low) and the mains charger is optimised for AGM with a specific AGM/Gel/Wet profile switch? I will take that as another success for our efforts. In July 2018 Manbat/Eurobat (biggest wholesaler in the UK) has revised the entire range of batteries they sell as 'own brand' style batteries. They have down graded EVERY budget Leisure batteries 'label' capacity. They are exactly the same battery as before, but now the label is more honest. All the batteries have had their label 'corrected' by between 5Ah and 10Ah less. I saw the old 85Ah and new 75Ah batteries side by side. Exactly the same battery, but the new one shows an honest 75Ah on the label. Anyone following our Forum threads will be aware that in the past we have applied 'pressure' to the battery wholesaler Manbat/Eurobat by putting their batteries through testing. Massive progress for the consumer and very well done to Manbat/Eurobat for more honest labelling. They said they wanted to change, improve and become the best battery wholesaler. Manbat have also committed to putting clear battery manufacture dates on all their batteries, a real plus for consumers who are sometimes sold batteries that have had their life shortened by being sat on the shop shelf for too long. The consumer can't currently tell the battery age very easily, but Manbat have committed to change that for the consumer. I truly believe that Manbat have recognised that things must change and are leading that change, please support them and that will develop further. 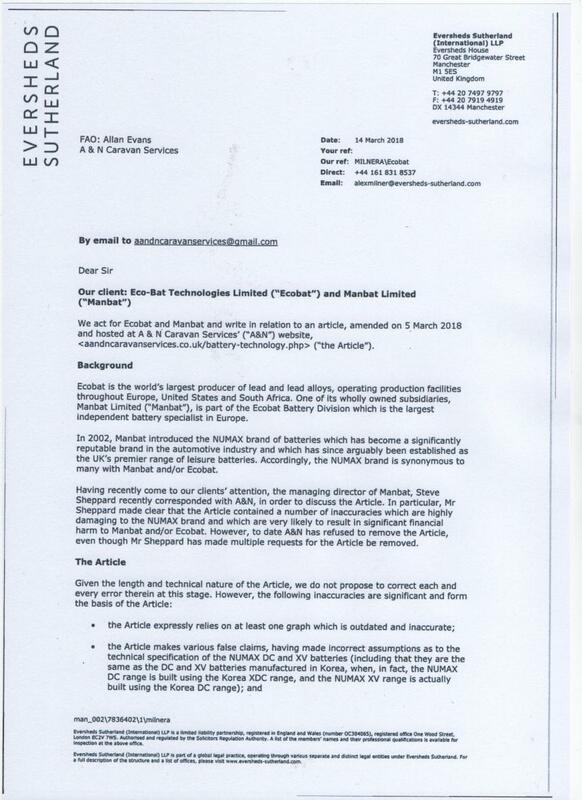 If you think we are taking credit when it isn't due, just take a look at the threats of Court Action sent to us in March 2018 in the letter from Eversheds Sutherland at the bottom of this page. While Manbats initial response was denial, the end result shows their change in approach. The Battery Wholesaler Platinum Batteries, on the other hand, have quite a way to go towards being more honest. We have been asking the NCC to publish the tests that prove the batteries perform as stated, because we have evidence many do not.
" bring transparency to the leisure battery marketplace and help consumers select a product that’s right for them"? But don't take our word for that. "Hello, We have heard through a web source that your Verified Battery Scheme is not what it seems. You state that "Battery verification comes via a comprehensive, industry-leading, testing process conducted by suitably certified and audited test houses”. Could you please confirm what test houses you use so we might verify your testing claims. If this is not possible might you supply some of the test results so we can put our member's minds at rest that recommendations from the council are based on sound, independent testing as promised? When the NCC replied, it didn't reveal the Test Houses it uses, or offer any Test results. It replied with a lot of woolly political style phrases that avoided the questions entirely. Not one question was addressed. The NCC is a company that in 2017 had a £244 million revenue and £18 million profit. The NCC is funded by the industry, for the industry. They are not the independent company that many think. Money changes hands to get a battery on the NCC webpages. There is no transparency to show that has been done ethically. The top government agency in the UK that sits above Trade Standards Authority, is investigating battery mislabelling and mis-selling. They describe the industry as 'corrupt'. That is a word they used to us and said we could quote. We would question the merit of the Camping Club and CAMC selecting the NCC for a scheme like this without also insisting on transparency. Challenging the NCC to be open and transparent is only one part of our drive for improvement through the whole Leisure battery industry, right down to battery labelling. 1. In a short time we have put batteries through tests and proved they have been deliberately overrated by the NCC. This is now being investigated by government agencies. 2. We have 'worked with a wholesaler' and their batteries have received down rated labels. 3. We have achieved a massive break through on the warnings that AGM batteries are rarely suited to Motorhome use. This is slowly being acknowledged by the Industry and it is now acknowledged by the CAMC, hopefully other clubs/magazines will follow. I would argue those are better results for the consumer in 11 months than the NCC Verified battery scheme have achieved in years. NCC VERIFIED SCHEME BATTERY - UPDATE. We have been sent a document that lists the full Technical details of the NCC 'Verified' battery scheme where the NCC clearly condone manufacturers misleading consumers. Section 6.1.7 in the document states that ONLY 6 CYCLES OF CAPACITY TESTING are necessary to confirm a manufacturers claims of battery capability. The manufacture just needs to submit a 6 cycle capacity test and that is enough to back up whatever the manufacturer claims about the battery spec. The durability of a Leisure battery, the most important thing to most buyers, is treated secondary and not tested adequately. "6.1.7 The testing shall then be repeated until a sequence of 6 cycles has been completed". Then they just make a guess. So, even where a test is performed it is wholly inadequate and in direct contravention of the spirit of the scheme. No wonder they won't publish any of the test results, they either don't have any or they are laughable. Why aren't the Camping Club and CAMC, who are the originators of the scheme, insisting on the scheme being more open to show it is 'above board'? Can we ask everyone to get involved, write to the groups involved, magazines, etc with questions on why the NCC don't publish the test results. If you want more evidence the scheme is corrupt, read on. The following document shows how deceitful the NCC are being, especially in light of the reply to the Motorhome Fun forum. 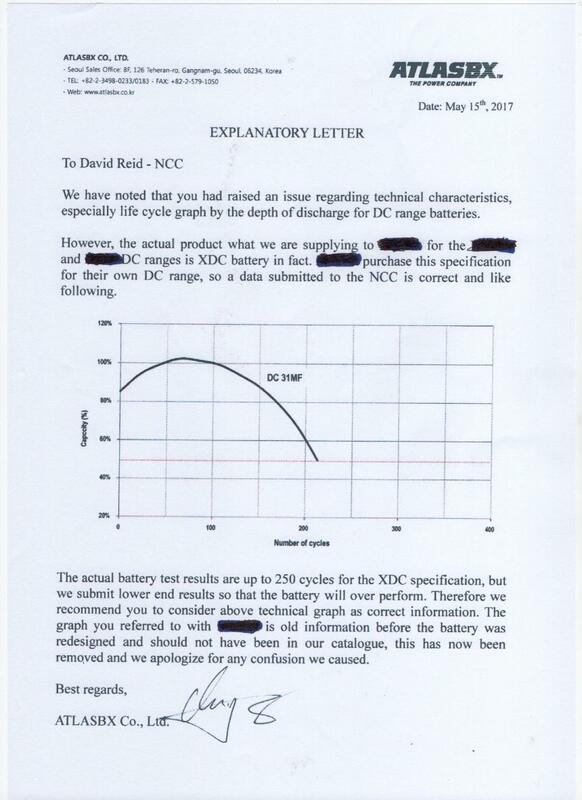 It was sent to David Reid of the NCC 'confirming' why the DCxx battery in question merits a high cycle rating when the Atlasbx Sales brochure showed the batteries have a cyclic capability of LESS THAN 80 CYLES. The Graph used in 'supporting' evidence in the letter above 'suggests' that the battery reaches a 'claimed' 220 charge/discharge cycles. However, you will also see that the graph shows how the capacity of the battery drops as the Charge/Discharge test progresses. Batteries lose capacity as they are used, a battery becomes 'smaller' with each use. A healthy 100Ah battery can be down to 90Ah maximum capacity at a year old. The industry regard a battery as exhausted when it's capacity drops to 80Ah in the case of a 100Ah battery. If you apply the rules of BS EN 50342, the graph shows the battery is exhausted at 160 cycles, but the Korean Battery company go on counting the cycles right down to 50% capacity. Obviously that breaches the BS EN 50342 guidelines but shows how some companies count the cycles the Top battery manufacturers think are worthless to the consumer. 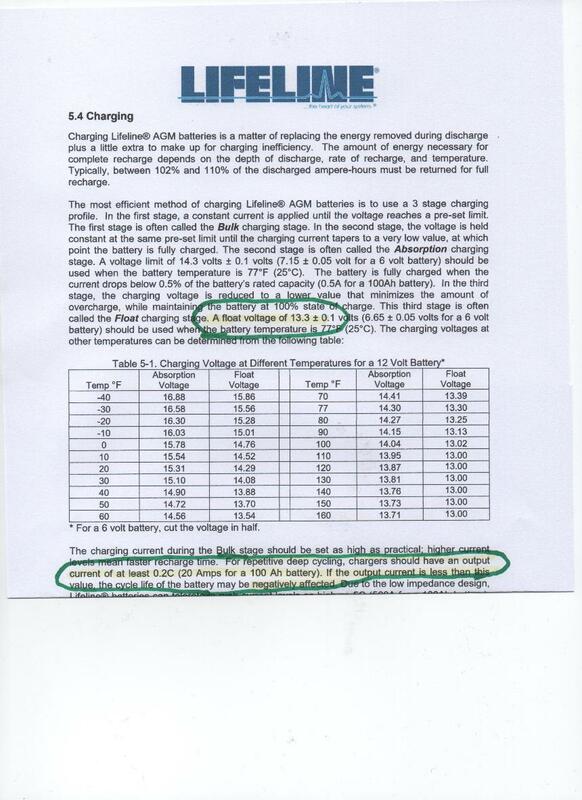 So while the letter actually contains a graph that proves the battery should be rated at a maximum 160 cycles, the NCC have listed it as 220 cycles. You may ask why did the NCC need a letter in the first place if the NCC have all the test data? "The graph you referred to with DCxx is old information before the battery was redesigned and should not have been in our catalogue"
You may also ask why was the NCC looking at the 'Sales Catalogue' in the first place and using it to query a batteries Tech. Spec, if it had all the laboratory BS EN 50342 test data? The battery has been listed in the NCC 'verified' scheme as having 220 cycles, so clearly this letter has been used to 'verify' the battery. The battery we tested didn't reach 80 cycles, a huge variance from the NCC 'Verified' 220 cycle rating. The Graph below from the Battery manufacturers catalogue shows the DC range ONLY achieves around 80 cycles at 50% Depth of Discharge (DOD) matching our test figure. That is clear evidence that the NCC portray the scheme very differently to the way it actually operates. The skills of the operators of the scheme, from it's setting up, description, aims, verification, etc all show a serious lack of battery knowledge and honesty. More worrying is that the Asian Battery manufacturers are testing to a completely different standard to that of the UK and ending up with far more cycles than the BE EN 50342 standards says should be counted. No wonder the Asian batteries, on paper, seem to outperform the likes of Banner, Varta, Exide, etc. "Battery verification comes via a comprehensive, industry leading, testing process conducted by suitably certified and audited test houses". Clearly this statement is intended to lead consumers into believing that audited test houses have carried out a testing process for the NCC to Verify those test results. The above documents prove that is not the case. Yuasa now prints on the battery casing the number of cycles a battery will achieve. We think every manufacture should follow this lead, so there can be no excuse or 'mixup' when the battery is independently tested by Trading Standards. In the mean time all of the testing we have done suggests that you should be safe buying big name battery manufacturers products, like Yuasa, Varta, Bosch, Exide and Victron Energy. In our experience these companies make quality long life batteries that perform to specification. However, we suggest you avoid - Platinum, Enduroline, Powerline, etc. It seems that the 'technical' author that writes the specifications for these companies is related to Hans Christian Andersen. But Worse Than False Figures. All the above questions what the NCC scheme is trying to be and the integrity of the data, but the third, most serious issue in my book, is that the NCC scheme is actively promoting AGM batteries that are unsuitable for the application the scheme claims they are 'Verified' for. "Please ensure your charging method can accommodate AGM batteries as charging at non AGM charge settings can adversely affect the life of the battery". A champion retailer - that is putting the consumer before profit. All big battery manufacturers state that their AGM battery must be charged with AGM optimised charging systems. Banner Batteries have an FAQ on their website with a question on charging AGM : batterieshttps://www.bannerbatterien.com/en-gb/Support/FAQ. Not only does it stipulate a higher 14.8v 'Boost' charge rate, but the Float rate should be an ultra low 13.5v, which is exceptionally rare on ANY Caravan/Motorhome multi stage charger, let alone an AGM specific version. "What values should I use when setting an external charger for AGM batteries in the caravan? How high should the charging and float charge voltage be?" "Please employ the AGM setting, which means that the charge voltage should be set at max. 14.8V and the float charge voltage at 13.5V. Best of all, use an IUoU characteristic with temperature compensation". See the full document near the bottom of this page. Note that it additionally suggests temperature compensation on the charger, something most AGM battery manufactures recommend. We would estimate less than 1% of Caravans/Motorhomes would have one of these. Some of the Sargent units have temperature sensing of the battery compartment, but not the battery plate temperature which generally uses a sensor on the battery clamp. If you look at the Concorde Lifeline battery table at the bottom of the page, you will see that their AGM batteries must not be maintenance/Float charged at higher than 13.3v at 21.1 degrees C/70 degrees Fah. or 13.1v at 32 degrees C/90 Fah. Compared to those very low voltages, a Motorhomes typical mains 13.8v charger in Spain in Summer is going to do reduce an AGM's life by a massive margin. We are not aware of any Motorhome/Caravan mains charger with 14.8v/13.4v mains charger and temperature compensation that has EVER been fitted to a mainstream Leisure vehicle up to early 2019. Few professional fit Solar Charger/Regulators have effective temperature compensation or charge profiles that follow the above guidelines. The battery manufacturers say that failure to charge an AGM exactly as the manufacturers spec, results in premature failure, often less than 2 years, typically 18 months. It makes me wonder if the promotion of AGM's by the NCC is a deliberate ploy to fatten the bank accounts of the companies who make payments to the NCC to have their batteries 'verified'? The sale of double the cost batteries with half the life of a budget battery delivers a big enough financial incentive to not be honest. We were highlighting premature AGM Motorhome battery failures in 2014, some that didn't last 18 months. See here for more info on the limitations of AGM batteries. The Battery Industries perception that Caravans and Motorhomes contain sophisticated chargers is wrong, they are often crude Power Supply/Chargers. Most don't even charge the habitation battery above 13.9v from the Alternator/Engine. For anyone who mistrusts our claim that 99% of British motorhomes don't have AGM optimised chargers, then read the "A bit of History on the Leisure battery chargers installed in Caravan and Motorhomes" section towards the bottom of the AGM Battery web page. Thank you to everyone who has offered help and support, really appreciated. We need to point out again that we do not have any evidence that any of the big name battery manufacturers have done anything wrong. The support we have had from the big Battery manufacturers has been exceptional. Some have already supplied BS EN test data to prove the batteries stated performance, despite the NCC saying the data can't be released. If anyone from 'Which' magazine is reading this, we could do with some help here!! We want the industry to work towards clearer battery labelling. We have talked before about a 'Traffic Lights' label on the battery. Is this what's required? We love the Yuasa new labelling scheme, it is clearly aimed at helping the consumer by delivering more information in a friendly, easy to understand way. But can it be enhanced further with more colour? If you look at the image below you will see all key symbols, circles for Leisure specifications and 'squares' for Starter battery, like cranking amps, etc. grouped together at the bottom left. See at the bottom right, symbols of a Motorhome, Caravan and Boat, obviously a proper Leisure. How beautifully clear is that? Hopefully, you will also note how clear the other labelling graphics are and see, for the very first time on a mainstream battery, that it publishes it's cyclic ability on the casing. We have seen official Test Data for this battery and it actually achieved over 230 cycles, but they did not want to overstate the specification so print 200 cycles. This is one battery that will outperform it's paper specification by a big margin. To have the real Cyclic Life printed on the battery case is a first by any battery manufacturer, but we hope it isn't the last. Note also the new graphic showing Watt hours, a much better guide to real capacity than just the Ah rating. This is a major step forward, well done Yuasa. People have asked for this clarity for years and Yuasa have delivered. I think we have found a manufacturer who really wants to drive change in the Leisure battery market place to help the consumer make a really informed choice on their purchase. Lets hope all the big players want to join in to create an informal European standard. This battery is truly a leader amongst batteries in so many ways that are good for the Leisure community. Battery Cycles could have a Orange/Yellow/Green/Light Green Circle with the actual number of cycles printed in the middle of the circle? Orange would indicate an ultra low cyclic light duty battery, say below 5 cycles. Yellow a low duty between 7 and 70, etc. The resting Battery Voltage could also have a colour code that somehow reflects a VRLA's nearer 13v compared to aconventional's 12.6v? The background colour behind the new graphics on the label, not necessarily the whole label, might be Pale Orange to indicate Wet Acid, Pale Green for Gel, Pale Yellow for AGM, and Pale Blue for Lithium. or whatever, etc. Maybe we should have a 'Price band' traffic light so anyone can see in a table those batteries which are low cost and those that need a mortgage? This same colour coding could also be used to very good effect in a Table of 'Approved' battery characteristics. Anyone looking for a medium cyclic Gel battery would just look at the rows in pale Green and at the columns in Yellow.